Conveniently located in central Phoenix, Arizona, the fabulous Garfield neighborhood offers an excellent location, ample entertainment opportunities, lovely residences, and much more. Regardless of your interests, you will not struggle to find enjoyable activities to fill your free time. Whether you are interested in nature, the arts, shopping, nightlife, or something else, you will discover plentiful entertainment opportunities that will complement your favorite pastimes. Gorgeous Garfield single-family homes, townhomes, and condos are ready to impress you, so now is the time to consider what it would be like to live in this beautiful neighborhood. Because this historic neighborhood is located within walking distance of Phoenix’s dynamic downtown, there will always be something new for you to discover. For example, if you enjoy spending time in nature soaking in the famed Arizona sunshine, then you will appreciate the close proximity of pleasant parks and natural areas. Envision invigorating bike rides, exhilarating hikes, relaxing strolls, and delicious picnic lunches. These attractions can easily fit into your everyday life when you are a resident of outstanding Garfield. When you are ready for a quick change of pace, simply walk downtown to enjoy everything this thriving area has to offer. Imagine dining in one of your favorite restaurants before attending an exciting professional sports game or a captivating live performance. You may also choose to tour interesting museums, peruse impressive art galleries, shop in eclectic boutiques, or appreciate beautiful architecture. After the sun sets, you will want to stay in the area to experience the bustling nightlife scene. No matter where your adventures lead you, you will be happy to think of your peaceful Garfield single-family home, townhome or condo waiting for you to return. An unparalleled location, stellar residences, and easy access to entertainment opportunities are only a few of the benefits of living in this incredible city. Attractive Garfield, Phoenix, real estate options are waiting to pique your interest, and you are sure to find something that suits your style. 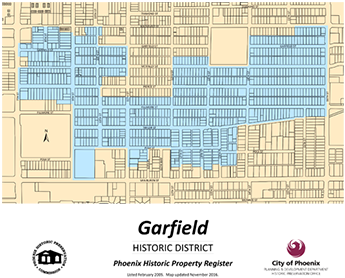 If you are ready for more information regarding picturesque Garfield, Phoenix, single-family homes, condos, and townhomes, please do not hesitate to contact us.